Everyone knows IKEA and the products they sell. 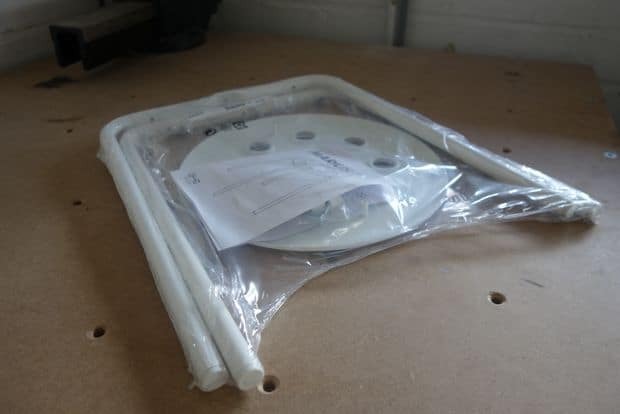 Initially, we thought that we’d stay away from anything record player related that IKEA produces since some members of the Reddit Vinyl community expressed their utter hatred toward their furniture. However, this is such a quick and simple DIY project that we couldn’t miss the opportunity to blog about it. The project is all about creating a custom vinyl record themed stool. Similar to our previous post about cupcake stands made from vinyl records, this is a great and very affordable idea. Let’s take a closer look at the project. You need a few tools, stools from Ikea, old records, and some glue. All credit goes to the writers from Instructubles.com for yet another creative project. Here’s a picture of the stool that was used in this project. At the time of writing this post, this chair only cost about $5. That being said, it’s probably not the world’s best chair, but it makes for a great custom project. If you have a few old records lying around you can easily create a set of chairs for less than $50. A local thrift shop or Goodwill store might have a few old records that you can pick up for a few dollars. 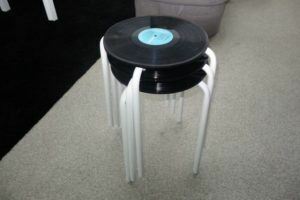 The vinyl records are attached to the IKEA stool with screws. What the designer did to strengthen it is to layer multiple records on top of each other to strengthen it. Now you don’t have to complain that there’s nowhere for guests to sit in your apartment. A few dollars and some handy work and you’ve got yourself a chair that you’re friends probably will want to copy.